This will be a short entry, more of a teaser than anything else. I’ve been in the kitchen making sugary concoctions, but won’t be able to post about them for a few days. I’m leaving for New York tomorrow morning to see the culinary school I’m planning to go to and taking plenty of treats with me for friends there. And just because I love New York so much, we’re spending a couple extra days exploring and having food adventures. Not the best idea considering my money has no real way to replenish itself at the moment, but I don’t go out much anymore so it’ll be worth it. The cookies in the pictures are actually made from extra dough. I’m putting the finishing touches on my first cookie-topped cupcakes this morning. The cookies that will go on top of the cupcakes are in a different (and much more tricky to cut out) shape, but are also cris-crossed with purple icing. These cookies aren’t really meant to be spectacular on their own, so don’t expect anything fabulous when you make them. I just love this basic cookie recipe. The original recipe comes straight out of the Joy of Cooking. The lavender is my own addition – I wonder when I’ll get tired of putting lavender in everything? Maybe when it starts looking/feeling more like spring outside (the snow is gone and it’s not FREEZING anymore, but it’s not warm and flowery yet either). 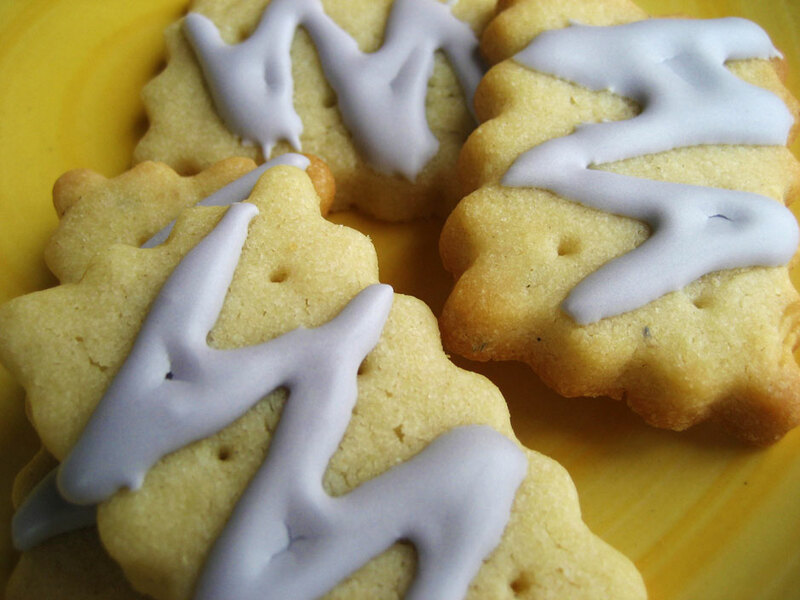 These would make great sandwich cookies, perhaps with some lemon curd? Cream the butter and sugar until light and fluffy. Add the egg, baking powder, salt, vanilla and lavender and beat until mixed well. Gradually beat in the flour. Turn our the dough and form it into a disk. Wrap in plastic and refrigerate at least 3 hours. Preheat the oven to 350. Roll the dough out to 1/4″ thickness and cut with cookie cutters. Bake on a parchment- or Silpat-lined cookie sheet for about 10 minutes, or until just golden around the edges. Allow to cool fully before icing. Sift the sugar into a bowl. Whip the egg white until stiff but not dry, then gradually add the sugar and other ingredients. If the icing is very runny, add more powdered sugar. Pipe with piping bag or use a toothpick for fine lines and details on cooled cookies. I’ve got another kind of lovely lavender cookies to share, as well as the final, assembled epic cupcakes. And some pate de fruits. And maybe some ice cream. But I have a feeling it will all have to wait until I get back – so Wednesday night or Thursday morning. By then maybe I’ll have some fun pictures and stories to share from New York – I always bring the camera and forget to take any pictures, but I’ll really try this time. At least to get pictures of some of the foods (ok, mostly pastries) I plan to eat. Best of luck visiting the school! You must be so excited. Must hear all about it when you get back! 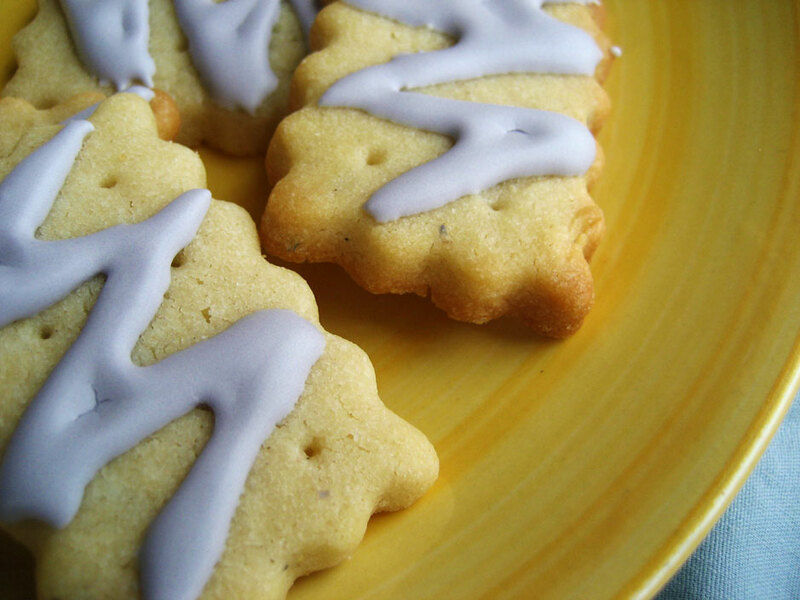 I’ll be right here, nibbling on the lavender cookies. Where are you going? I went to FCI – it was great…I loved it. Good luck! Have fun in our awesome city! if you’re coming here, there are a few sweets you need to try. a creme brulee doughnut at the doughnut plant (lower east side). an adorable little chocolate-chestnut cake from kyotofu (hell’s kitchen). a matcha latte from tafu (midtown east). and top it all off with a custard from shake shack- it’s worth the wait.